Update: The boil-water notice was lifted Saturday morning, Dec. 1, city officials said. 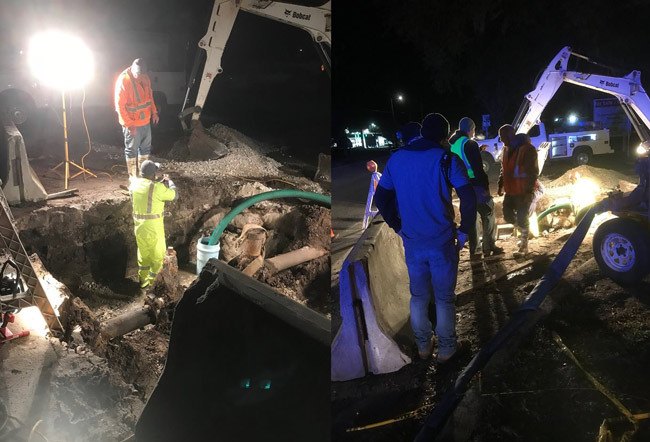 Bunnell residents, businesses and government offices, including the courthouse, have been under a boil-water notice since Thursday following repairs to a watermain on East Moody Boulevard. The city hopes to green-light regular water usage before the weekend. The city shut down its water plant on Nov. 28 just before midnight, cutting off water service city-wide, to facilitate the repair of a crippled valve on a 6-inch watermain. City crews worked in frigid temperatures through the night to make the necessary repairs, the city said in a release issued Thursday. The boil-water notice does not affect dish-washing, laundry-making, lawn-watering and other uses of water for non-potable needs. Under a boil water notice, water used for drinking or cooking consumption can be disinfected by any one of the following methods: Bringing the water to a rolling boil and holding it there for one minute, or using a disinfecting chemical. The city advises that if you cannot boil water, you should put eight drops of common unscented household bleach or one-eigth of a teaspoon, in one gallon of tap water. Shake and allow the water to stand for 30 minutes before drinking. If the water is cloudy, use sixteen (16) drops, about 1/4 teaspoon of bleach instead of 8, shake it, and let it stand for 30 minutes. There should be a slight chlorine odor. Use common household bleach that has 5 to 6 percent active ingredients. Use food grade containers. You may also use water-purification tablets or iodine that many sports and camping stores sell, or you may buy commercial bottled water for consumption and food preparation as an alternative. It is the second time in less than three months that city-wide serviec had to be shut down. Service was shut down at the beginning of September, though in that case it was the result of a vehicle crash into a hydrant, which then required repairs. The city may be reached at (386) 437-7500. Again???? Mayor Robinson has lived here all her life and been involved in local government for many years to not have prepared for restoration of a deteriorated system. She has failed us miserably and all she seems to be concerned about is showboating publically and worrying about how she can get Nate McLaughlin a job. Birds of a feather flock together!! The same is true with Mr. Tucker…..why are you too sitting on your hands an doing nothing but promoting Nate McLaughlin? Both of you need to be replaced. Neither of you have done much of anything for us citizens and we pay the price for your lack of leadership. Shame on you! The city just violated the law. What happened to the boil water notices delivered door to door. What happened to the call from the 800 number?